We have around 1800 acres of a corn and bean operation. We spray everything 3 times – pre, post, and fungicide. 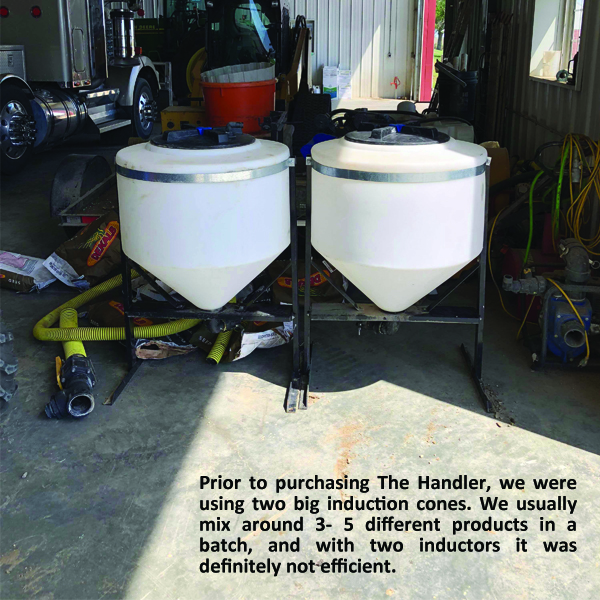 Prior to purchasing The Handler, we were using two big induction cones. We usually mix around 3- 5 different products in a batch, and with two inductors it was definitely not efficient by any means. Trying to rinse out jugs and the inductor cones between batches was nearly impossible to do on the truck – not only did it take too much time, it was also challenging trying not to get any product on you. We wanted to both eliminate the clutter on the back of the nurse truck caused by the hoses with having two inductors, while also making it faster, easier and safer. We also wanted to only have one guy mixing up batches instead of two. Switching to The Handler II made mixing go so much smoother. 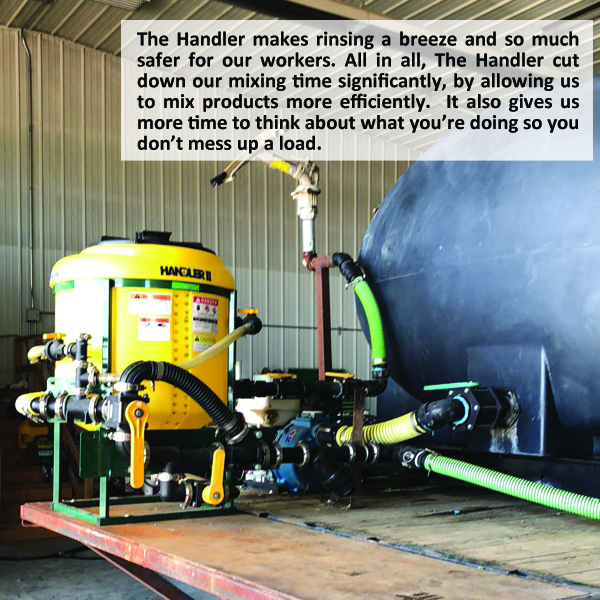 The Handler makes rinsing a breeze and so much safer for our workers. All in all, The Handler cut down our mixing time significantly, by allowing us to mix products more efficiently. It also gives us more time to think about what you’re doing so you don’t mess up a load. But the best part is there no more reaching around for hoses or valves – everything is right in front of you and nearby! Thank you for making such a great product.